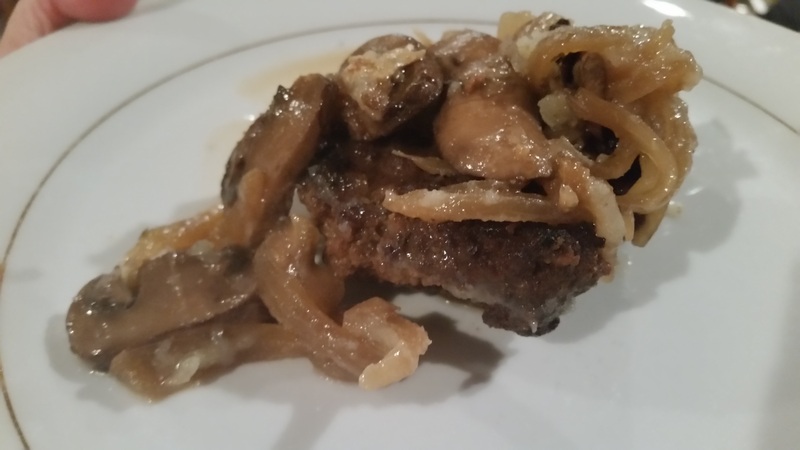 Slow Cooker Salisbury Steaks – What's for Dinner Moms? I loved Salisbury Steaks growing up. We would get the TV dinners (remember when they were called that?) with the metal three tray compartments. I would either get Fried Chicken or Salisbury Steak with mashed potatoes in one little compartment and corn in the other. They were a great treat growing up. I don’t know why I have never thought of making them before. I think every time I thought about them the thought of frying the patties before putting them in the slow cooker seemed like such hard work. Yes, I can be that lazy some days. I finally decided yesterday that I needed to try making them. At first my daughter was a bit put off by the smell of the meal because it had a heavy onion smell to it. But, as it cooked it smelled better and better. There was one lunch portion leftover and it was rather tiny. Both kids really liked the flavors and asked me to make it again. I served this over mashed potatoes, which are not in the picture because by the time I got home all that was left was a Salisbury Steak and a few onions and mushrooms, a side of green vegetables and a salad. Place onions and mushrooms in the bottom of the slow cooker. Mix ground beef, soup mix, bread crumbs, and milk in a bowl until well combined. Form 6-8 patties that are good-sized and about an inch thick. In a large skillet over medium high heat allow the oil to warm as you lightly flour the patties on both sides. Place 3-4 patties, carefully, in the oil. Allow to brown for 3-4 minutes per side. You want a nice brown crust for best flavor. 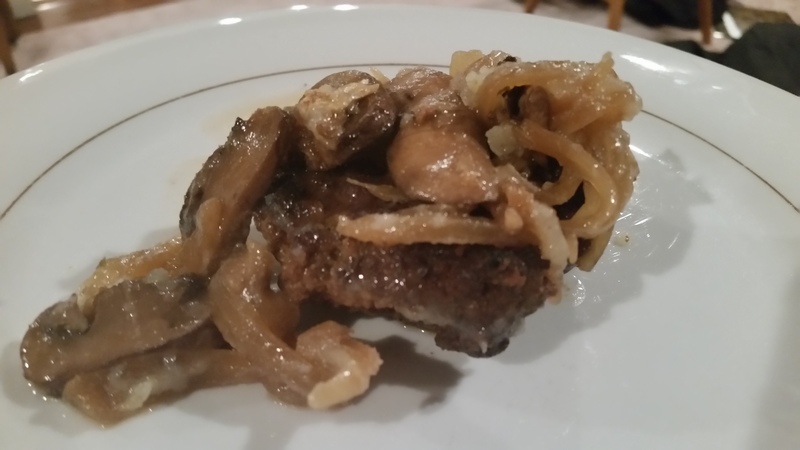 Remove patties from pan and place on top of onions and mushrooms in slow cooker. Once all patties are browned and in slow cooker add beef stock and minced garlic to bowl. Cook on low for 5-6 hours. Remove patties from slow cooker to plate. Turn slow cooker to high. Mix corn starch and water until cornstarch has dissolved. Add to slow cooker and stir well. Cover and allow to sit for 5-10 minutes to thicken. If it has not thickened to your liking mix cornstarch and water one teaspoon at a time and add to gravy until desired thickness is reached. Taste and add salt and black pepper as needed. Return patties to gravy to warm. Serve over egg noodles or mashed potatoes as desired. Yum…on this cold day…works for me! Thanks! Thanks! I agree. It’s only 25 degrees today. Ick. Yum! One of my favorite foods! Salisbury Steak was always one of my favourite TV dinners. I just cooked Salisbury steak on my day off Tuesday. This actually reminds me of eating porkchops and onions growing, especially when you talk the smell. I loved those tv dinners 😀 Have a great weekend, Marci! Thank you,! You too, Sylvester! You’re welcome, Marci and I will!